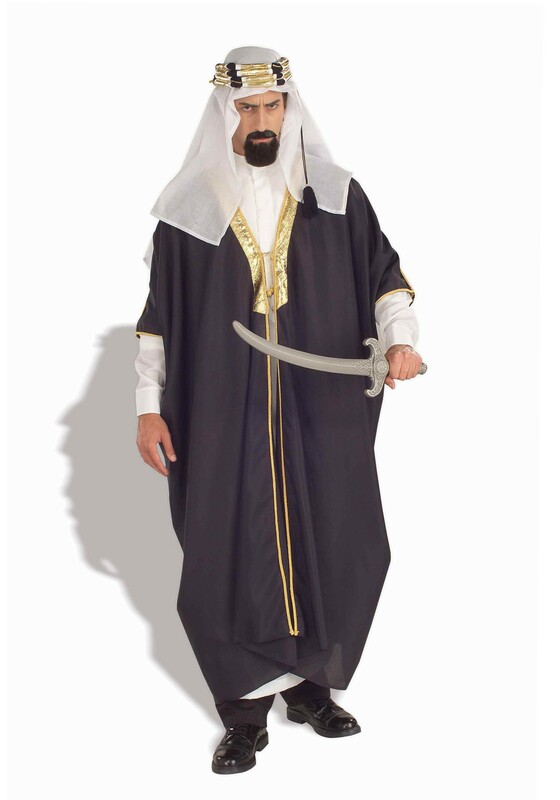 This Mens Arabian Chieftain Costume is 100% polyester costume with plastic buttons on the tunic at the neck and at the sleeves. The robe attaches with a tie in the front and features gold accents, and the headpiece snaps in place thanks to a black- and gold-accented headband. We've got the hook-ups here when it comes to the ensemble, but to get your slice and dice on, you'll have to grab the sword separately. Don't worry, though, we have plenty of those bad boys. Best of luck on your epic adventures through the desert and well beyond! Just don't forget to hydrate. That's very important.